Book review: "Adrenaline: A Thriller"
This review first appeared in Turbula in July 2011. Spy thrillers offer perhaps less opportunity for innovation than any other form of literary fiction. You have to have spies, you need the good guy-bad guy tension, and of late, you need a bit of mystery about just who's good and who's bad. The variety of story lines able to fit into the above criteria is obviously limited  so the outstanding thrillers, the ones that hold our interest, that keep us turning the page long after we should have turned off the lights and called it a night, are the ones that are executed the best. 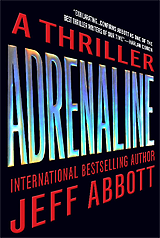 On that score, Jeff Abbott's "Adrenaline" succeeds wildly. Drawing on much the same territory that Len Deighton and Olivenhain's Christopher Reich have mined so richly and successfully, the heart of Abbott's story rests in a couple where the husband isn't quite sure whether his wife has betrayed him  and their country. Sam Capra is a CIA operative whose wife, Lucy, calls and tells him to get out of his London office shortly before it is destroyed by a bomb. He is arrested by the CIA and questioned for months before finally being released from prison and put on very closely supervised work release. Determined to prove that his wife is innocent of treason (and desperate to find the baby she was carrying when she disappeared), Capra escapes his CIA handlers and gets back to Europe with the help of a mysterious ally to start piecing together the bombing and his wife's subsequent disappearance. Nothing particularly noteworthy in any of that  Reich's Jonathan and Emma Ransom ("Rules of ..." series) and Deighton's Bernard and Fiona Samson ("Berlin Game," etc.) both featured the same dynamic of domestic stress meeting international intrgue. Instead, what makes this such a rewarding read is Abbott's skill as a writer: his timing, his character development, the believable dialogue. Very action-oriented and fast-paced, the book reads almost like a novelized movie script  and it wouldn't be surprising to see this story on the big screen in the next few years. The book ends well, too, with enough closure to brings this particular episode to a close  but with plenty of unanswered questions that make a sequel unavoidable.